The kids and I went to STEAM night at their elementary school, and learned how to make Wildflower Seed Bombs to plant here in our own garden at home. We have this huge boxed in garden area of our backyard that gets sun but not enough for veggies and the like. I think wildflower seeds would do WONDERFULLY there! It doesn’t take a lot of time or energy to put these together. Because they’re made with clay, the kids can really get into making these, they think it’s a ton of fun! Place the wildflower seeds on a paper plate. On an additional plate, sprinkle the plant food. Take sections of clay into your hand that, when rolled into a ball with your hand, make balls about an inch thick across. Roll each ball into the wildflower seed completely. Massage the seeds into the ball so that the seeds are completely mixed in and then roll the clay again into a ball. Dip each ball into the plant food but don’t coat it entirely as you did the plant seed, only do maybe, at most, half the ball. Massage the plant food into the ball the same way you mixed in the wildflower seeds, and roll once more into a ball. 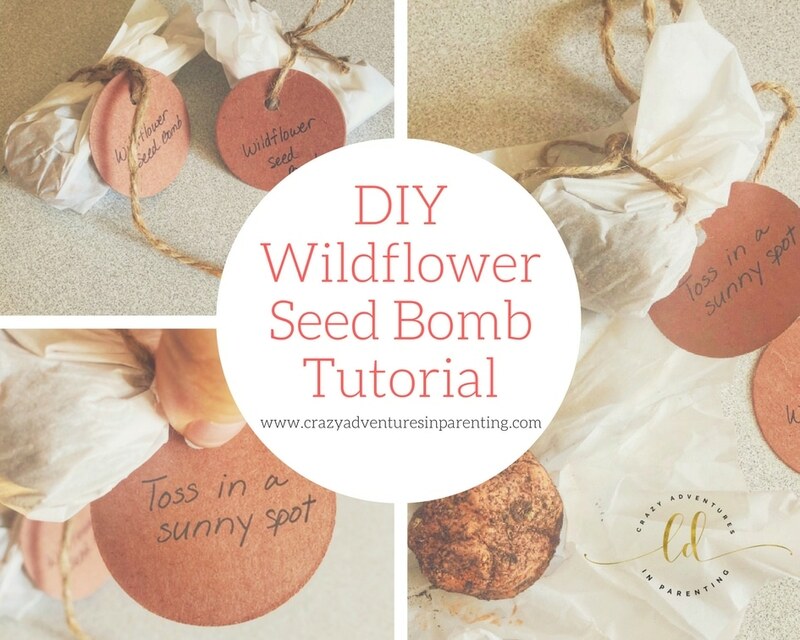 Wrap the wildflower seed bomb into parchment paper and tie with twine to keep. Before you decide to plant, unwrap them and let them air dry (maybe on a windowsill) for 48 hours before planting. Pop it into your planting spot, cover with dirt/soil, water, and water! Check out my other crafts here, like these beautiful Paper Rosettes!